Ruth Fischer once ranked among Germany and Europe’s most prominent women. Right after the end of WWI, she co-founded the Communist Party of Austria, became famous as the chair of the Communist Party of Germany in the Weimar Republic and, after 1945, was associated with the anti-communist crusade in the United States where she authored the best-selling book Stalin and German Communism. At the end of her life she vainly hoped that the Soviet Union under Nikita Khrushchev would move towards a more democratic variant of communism. 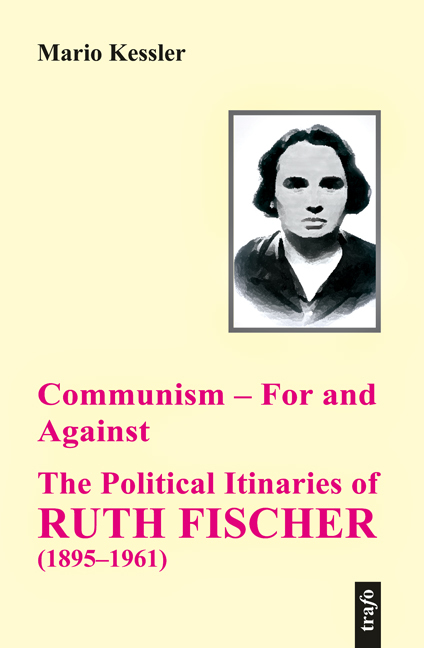 Ruth Fischer was the sister of two other prominent Austrian-German communists: the composer Hanns Eisler (1898–1962), a disciple and friend of Arnold Schönberg, and the journalist Gerhart Eisler (1897–1968) whom she would denounce as Moscow’s most dangerous communist agent in the United States. To explain why Ruth Fischer’s political itinerary went to such extremes – astonishing even in the ‘Age of Extremes,’ to mention Eric Hobsbawm – is the purpose of the following remarks. Ruth Fischer (born Elfriede Fischer) came from a middle-class family. She was born in Leipzig on 11 December 1895. Her parents married only a few weeks after her birth and their daughter received her father’s family name of Eisler. The family soon moved to Vienna where her father held a position as senior lecturer in philosophy at the university. Since her father, Rudolf Eisler (1873–1926), who was of Jewish origin, refused to be baptized he was never promoted to full professor. Elfriede’s mother Maria (1876–1927), who had worked as a domestic servant until she married, was Protestant. The three children grew up in a liberal and agnostic household. After finishing high school in 1914 Elfriede Eisler studied pedagogy, economics, and philosophy at the University of Vienna. Soon after the war begun in 1914 Elfriede and her brothers, who were both waiting for conscription, founded a left-wing student group that expressed a strict opposition to the war. She also belonged to a circle around the left-wing Freudian psychoanalyst Siegfried Bernfeld with whom she probably came in contact through her brother Gerhart. Another member of this circle was Paul Friedländer, a fellow-student whom Elfriede married in 1917. In December of that same year, her son (Friedrich) Gerhard was born. The group produced and distributed anti-militaristic leaflets and read the writings of radical leftist critics of war, militarism and imperialism, among them Lenin, Zinoviev, and Rosa Luxemburg. In October 1918, Elfriede Eisler wrote a brochure on sexual policy in an anticipated communist society. At the same time she left the university without finishing her studies. On 3 November 1918 a group of around forty people including Elfriede, her husband and brothers, founded the Communist Party of Austria. She became, as her membership card testifies, member number one. According to her later reminiscences, the Communist Party of Austria was founded on the initiative of Russian Communist Party representatives and, unlike the Communist Party of Germany, the Austrian Party owed its existence from the very beginning to the efforts and the money of Russian Communists. During the first months of 1919 armed revolts swept all over Germany. In some states Councils Republics were proclaimed and existed, most prominently in Bavaria, even if only temporarily. The failures of these revolutionary attempts were a major setback for the Communist Party of Germany (the KPD). Following the assassination of its leaders Karl Liebknecht, Rosa Luxemburg, and Leo Jogiches by the right-wing paramilitary Free Corps, Paul Levi became chair of the party. Unlike many Russian Bolsheviks who "tended to treat every piece of news dealing with unrest in Germany as a sign of imminent social revolution" Levi led the party away from the policy of immediate uprising. He made a serious effort to win over supporters from the Social Democratic Party (the SPD) and the Independent Socialists, the USPD. These efforts were rewarded when a substantial section of the USPD joined the KPD in December 1920 making it a mass party. At this time Ruth Fischer was already a rising star in German radical politics. After a failed attempt to gain exclusive leadership of the Austrian communists, she left Vienna in late August 1919. While her husband remained in Vienna, Fischer went to Berlin. Her son remained with her parents in Vienna. After her arrival in Berlin she used the name Ruth Fischer in public. Divorced in 1922, she officially married the KPD member Gustav Golke a year later to obtain German citizenship, but the marriage remained one of convenience. Soon she found a job at the women’s office of the KPD with Paul Levi’s support. A few months later, Karl Radek, the Communist International’s emissary to Germany, recommended that she work for the Western European Secretariat of the Comintern. While starting her work as a full-timer Fischer went into active politics. In December 1920 Ruth Fischer was among the KPD delegates at the conference that merged with the left wing of the USPD forming the VKPD (United Communist Party of Germany; the party regained the old name KPD two years later). Fischer’s political activities earned her the position of chair of the party’s district organization of Berlin-Brandenburg, the party’s largest provincial branch. She found support from two politicians who represented the leftist opposition to Levi’s more moderate course: Ernst Friesland, better known later as Ernst Reuter, the social democratic mayor of post WWII West Berlin, and Arkadij Maslow who would soon become Ruth Fischer’s life-long partner. Maslow (1891–1941), born in the Ukraine under the name Isaak Chemerinskij, had abandoned a promising career as a concert pianist as well as his university studies in mathematics to devote his whole life to communist politics. From 1921, together with Ruth Fischer, he led the Berlin-Brandenburg district organization of the party. The left-wing faction around Fischer and Maslow became known as the Berlin Opposition. It criticized Levi’s attempts to cooperate with the SPD and particularly with its more radical currents. Following bitter disputes within the KPD, Levi resigned from the leadership of the Communist Party in January 1921. Only two months later, under the influence of the Hungarian Comintern emissary Béla Kun, the party launched the March uprisings of 1921 in Central Germany. Following the uprisings, which were soon suppressed by army and police units, Levi was expelled from the Communist Party for publicly criticizing party policies. Immediately after Paul Levi’s resignation the influence of the Fischer-Maslow faction increased within the party. In November and December of 1922 Fischer participated in the Fourth World Congress of the Comintern in Moscow where she met Lenin and Trotsky. In an unofficial meeting that was arranged between the German congress delegation and the Soviet party leadership she spoke, in her own words, "vehemently and brutally against the policy of the German Central Committee, attacked the New Economic Policy irreverently and criticized the Russian Communist Party without the servile attitude of deference toward Lenin that had already become habitual with all foreign Communist leaders." Consequently, neither Fischer nor Maslow would obtain seats in the new KPD Zentrale (later: Central Committee), the party directorate. Control over affairs passed into the hands of Heinrich Brandler, August Thalheimer, and Walter Stoecker. Brandler in particular soon realized that the vast majority of German workers refused to be dragged into adventures without any purpose or sense. Throughout 1921–22 the moderate and the leftist tendency were both seeking support from the Comintern headquarter in Moscow. The Fischer-Maslow faction had, at that time, support from Karl Radek. The Comintern’s official expert for German affairs warned the party against the "dangers of opportunism." It was the intervention of Lenin and of the Executive Committee of the Comintern (ECCI) that was sufficient to bring about the adaptation of a united front policy. In January 1923 the German government claimed that it could no longer afford the reparation payments required by the Versailles Treaty. When it defaulted on some payments, French and Belgian troops occupied the Ruhr region, taking control of most mining and manufacturing companies. Strikes were called, and passive resistance was encouraged. These strikes lasted eight months, further damaging the economy and increasing the expense of imports. The strikes meant no goods were being produced. This infuriated the French occupants, who began to kill and exile protestors in the region. Since striking workers were paid benefits by the state, much additional currency was printed, fueling a period of hyperinflation. Soon the Germans discovered that their money was worthless. This led the Comintern to conclude that a revolutionary situation had arisen in Germany. The leftist tendency within the KPD gained ground. At the end of March 1923 Fischer and Maslow were among the organizers of a conference of trades’ councils of the Ruhr region in Essen (right after the KPD district conference at the same place) to discuss revolutionary action. Radek even went as far as to propose a united front of Communists and what he called "revolutionary nationalists" in the struggle against Western imperialism. In an enlarged ECCI meeting held in June in Moscow he gave a speech that became infamous as ‘The Schlageter Speech.’ Leo Schlageter, a young Nazi, had been convicted to death and executed by a French military court after attempting to blow up a railway line in the occupied Ruhr region. You cry out against Jewish capital, gentlemen? Whoever condemns Jewish capital, gentlemen, is already engaged in the class struggle, even though he does not realize it. You are against Jewish capital and want to eliminate the stock manipulators. This is right. Trample the Jewish capitalists under foot, hang them on the lampposts, and stamp them out. But what do you want to do with the large capitalists, the Klöckner, Stinnes…? Much later Ruth Fischer pretended that this "episode has been cited and distorted over and over again in publications on German communism." But she used the same form of argumentation again: "I was obliged to answer some anti-Semitic remarks. I said that Communism was for fighting Jewish capitalists only if all capitalists, Jewish and Gentile, were the object of the same attack." It must be said that the notion of ‘Jewish capital’ confirmed the stereotype of the powerful, yet simultaneously hidden, ‘alien’ capital that is foreign to the German ‘proletarian’ nation. Fischer saw on the one hand the ‘rich Jews’ who accumulate money without themselves productively working and on the other hand the ‘visible’ German big entrepreneurs. At the height of the Ruhr crisis Ruth Fischer called on workers to seize the factories and mines, to take political power and establish a Workers’ Republic of the Ruhr. This republic would then become the base for a Workers’ Army that would "march into Central Germany, seize power in Berlin, and crush once and for all the nationalist counter-revolution." During the summer of 1923 riots and strikes against the galloping inflation erupted all over Germany. Hundreds of thousands participated. There were serious differences within the KPD about how to deal with this situation. The so-called rightist group around the party chair Heinrich Brandler stood by their view that Workers’ Governments on the state and local level should be formed. Radek, who now refrained from his former position, supported this orientation. However, the KPD leadership’s attempt to join the left-social democratic governments in the states of Saxony and Thuringia came under attack from the group around Fischer and Maslow. They saw Germany as mature enough for revolution and criticized sharply what they called the reformist passivity of the circle around Brandler. In both states, Saxony and Thuringia, the KPD joined left-wing SPD governments on October 10 and 16 respectively. As early as 21 August 1923 the Russian party leadership decided to prepare for a revolution in Germany and constituted a Commission for International Affairs to supervise the political radicalization in Germany. It consisted of Zinoviev, Kamenev, Radek, Stalin, Trotsky, Chicherin, Dzerzhinsky, Pyatakov, and Sokolnikov, i.e. almost all of the prominent Bolshevik leaders. Financial, logistical and even military support would be provided to arm the paramilitary units of the KPD, the Proletarian Hundreds, which had been set up over the previous months. Simultaneously Gregory Zinoviev, the chair of the ECCI, helped Ruth Fischer to become a member of the KPD Zentrale while she was in Moscow. In October Radek, Pyatakov and Sokolnikov were sent to Germany to assist the revolution. The date for the uprising was set for 9 November. However, on 26 September, German chancellor Gustav Stresemann announced the end of passive resistance against the French-Belgian occupation of the Ruhr. He argued that there was no other way to get hyperinflation under control. On 13 October the parliament passed an empowerment act that allowed the government to abolish most of the social achievements of the November Revolution, including the eight-hour workday. The SPD parliamentary fraction voted in favor of this act. With the support of German president Friedrich Ebert, the army – or Reichswehr – stepped up its pressure in Saxony and Thuringia and issued a direct order banning the Proletarian Hundreds, giving them three days in which to give up their arms. The ultimatum was ignored. On 21 October the army entered Saxony. The workers’ protest was so massive that the SPD was obliged to resign from the Stresemann government in Berlin. The KPD had to bring forward its plans for insurrection. It called a congress of factory councils in Chemnitz, Saxony on 21 October. This congress was supposed to call a general strike and give the signal for the desired German October Revolution. But because the left Social Democratic delegates disagreed, Brandler called off the uprising. "During the Chemnitz conference I realized once we had been unable to convince the left Social Democrats to sign the decision for a general strike that we could under no circumstances enter the decisive struggle," he wrote. Brandler also saw that the Proletarian Hundreds were not well enough equipped with arms. This decision did not reach Hamburg in time. Here a communist insurrection was organized but it remained isolated and was quickly put down. For a few months the KPD, together with the Nazi Party after its ill-fated Beer Hall Putsch in Munich, was outlawed, a decision that was revoked on 1 March 1924.